Geek Girls Rule! #252 – Fame and Misfortune by Kel McDonald – Geek Girls Rule!!! Kel McDonald draws and writes the Sorcery 101 webcomic, of which I am a huge fan. She has several other projects going on, but this time I want to talk about Fame and Misfortune. 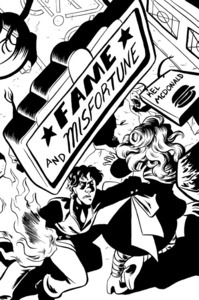 Fame and Misfortune takes place in the same world as her Sorcery 101 webcomic, but focuses on completely different characters. Rebecca is a werewolf with magical abilities, who is hired to protect the spoiled pop star, Mistress Lala. In the course of running down a would-be attacker, she rescues and possibly bites, Marnie. While protecting Lala, Rebecca also has to explain to Marnie what might happen if she did indeed break the skin, and brings Marnie along on her assignment. The art is wonderful. Rebecca is purposely not pretty, but is instead very capable, tough, and appealing in her own way. The story is well-paced, the dialogue flows well, and there’s enough exposition to keep you clued in, but it never becomes onerous or obvious. It just seems like someone explaining things to a new acquaintance that they might need to know. The action sequences are well drawn. And Rebecca’s relationship with Connor is remarkably natural and realistically antagonistic. I was 97% sure I’d like it, based on the fact that I do adore Sorcery 101. If you’re a fan of the Dresden Files, or Hellboy I’m pretty sure this comic will appeal to you. Sorcery, werewolves, lesbian werewolves… Did I mention, Rebecca is an unabashedly queer character. We need more of them around. I don’t know what else to say about it without sounding even more like gribbly fangirl, or giving away too much of the plot. It’s a quick read, $10 and well worth it. Order it from Kel’s page today! Next Post Geek Girls Rule! Podcast #34 – Norwescon Wrap Up!